a warming Arctic will melt peat in permafrost which could oxidize and release carbon. increasing drought will cause more forest fires which release carbon from forests into the atmosphere. humans clear more forests which could cause soils to release carbon. You can see that 2011 was a slightly better than average year, and that overall there is no sign of reduction in the carbon sink at the moment - in fact it's been gradually increasing as a fraction of emissions. If you try to fit a quadratic to the data above, it perfectly reproduces the straight line. The bending down one might worry about is not evident at present. I think the another plausible reasons to worry about this carbon sink becoming less effective in the future is to do with ocean productivity and turnover. But maybe there is a bending down of a kind. Atmospheric CO2 concentration is higher every year, so more carbon is available every year for the sink. 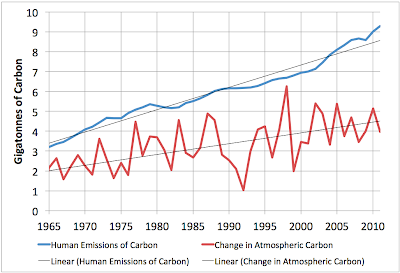 The rate of growth for carbon is quadratic since the rate of net input to the atmosphere grows linearly. 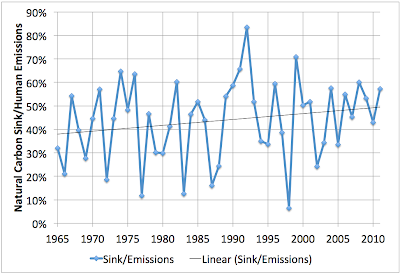 Then, the fraction of the total available carbon that the sink is trapping is less and less every year. Luis: You raise a good question. I think the right way to think about it is, how does the size of the sink vary with the departure of the CO2 concentration *from the pre-industrial condition* - the pre-industrial one being where we would expect zero net sink since, presumably, things were pretty much in equilibrium then. I added an extra graph to the end of the post that shows this relationship. You can see that it's very close to linear, and to the extent there is any curvature, the sink is tending to be stronger at higher departures from pre-industrial (though I doubt that curvature is statistically robust). 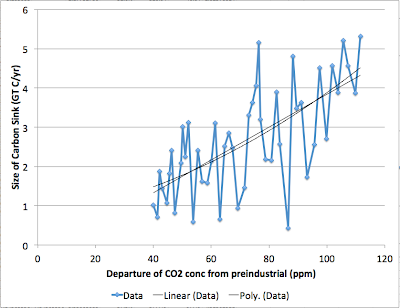 Any chance of a graph of [Sink size/atmospheric CO2 content] vs time? i.e. 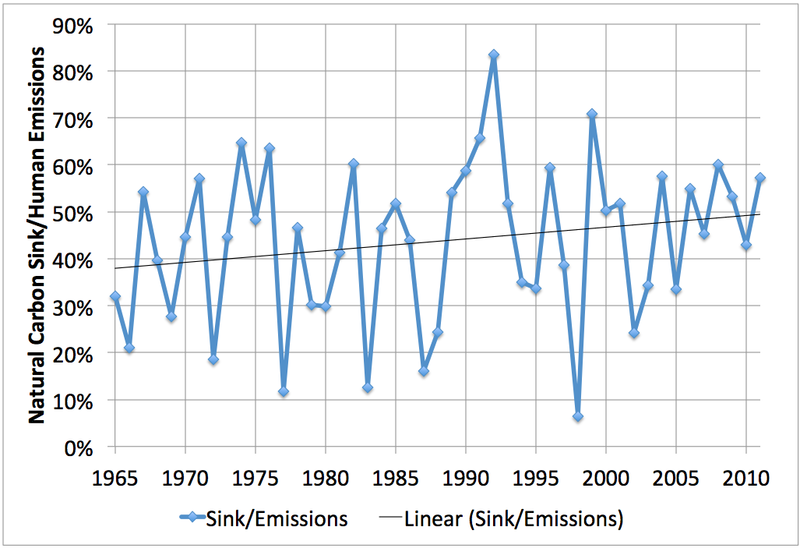 sink size as fraction of total in atmosphere, year by year. physicist - you can pretty much figure that graph would look rather flat - there's about 800GT of C in the atmosphere and annual emissions are running 9GT (and less in the past) so of order 1% - then the sink is smaller than that. So in any one year it's a small fraction, but over the decades it accumulates to become a very material change. You might also consider the upward slope recently could be a result of the higher frequency of La Nina, which exposes cold Pacific water at the equator, absorbing co2 more effectively. If/when we get decade with more El Ninos than average, the absorption by the ocean will fall. I think if you were to stop your trend line at 1998 (the strongest El Niño recently, after a string of several El Ninos), it would have bent the quadratic fit downward at the end. The tendency to see more frequent La Ninas could be random chance, or a consequence of greater heat content in the ocean, or some other climate-change effect. I think we have to take long term averages to find any sign of reduced sink efficiency. For sure, there's nothing going on as of 2011 that looks like a problem, but the current upward slope could be just "weather" and could change with a run of El Niños - and that would be just "weather", too. 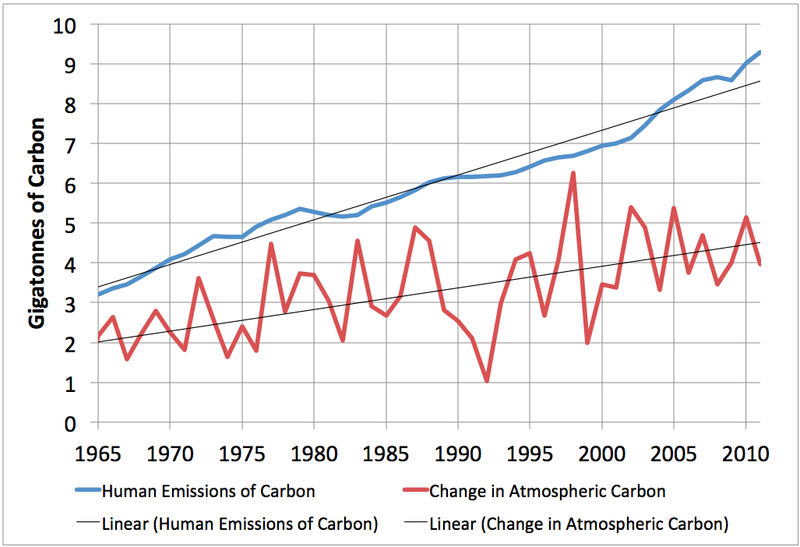 What the heck happened in 1992 that reduced the change in atmospheric carbon to the lowest since at least 1965 (1%)? And, what happened in 1998 that increased it to over 6%. Could we recreate the 1992 conditions and avoid those of 1998? William - I completely agree things could change in the future for a variety of reasons including the one you mention - hence the "so far so good" framing. Fred - good question and I don't know the answer. My understanding is that Pinatubo reduced the level of sunlight reaching the earth and also caused drier conditions so you'd think that would reduce carbon absorption by the biosphere. However, there's no question that 1992 was the lowest increase since 1965. I doublechecked at http://www.esrl.noaa.gov/gmd/ccgg/trends/ to make sure I just didn't have some screw-up but it's quite visible in their third graph. which suggests that it might have been due to ocean fertilization - Pinatubo released a lot of iron bearing rock dust into the atmosphere and might have caused a phytoplankton bloom in the ocean. Thanks for that last graphic added. And yes, yours seems the right approach to me too. By the way, I prefer the linear fit than the quite similar within the data polynomial one. 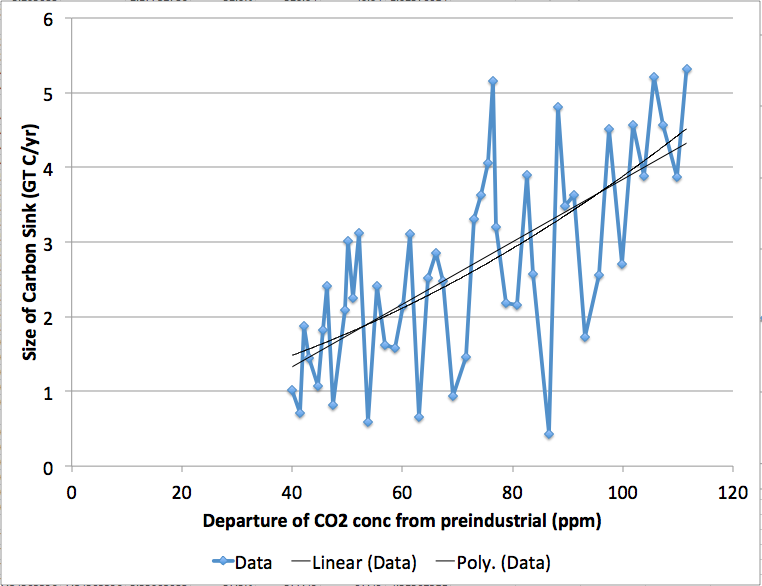 The linear fit seems to go fairly close to the (0, 0) point, thus indicating proportionality between the size of the sink and the departure of CO2 concentration from equilibrium. That proportionality sounds to me quite plausible at least for the ocean part of the system.